It took 10 years, but Honda has finally updated the popular ST1100 Pan European. And this is no facelift – it’s a whole new bike from the wheels up. Even the name has changed – it’s now called the STX. The only things that seem to be left untouched are the V4 engine configuration and the bike’s ability to munch miles by the trough-load. The first major change is the chassis. The ST1100’s tubular steel item has been replaced with an alloy beam design that not only saves weight, but will also increase rigidity. 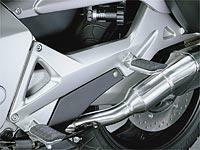 Coupled to this is a stronger, lighter aluminium swingarm, which incorporates the shaft-drive in the right-hand side. Hung underneath is an all-new 16-valve V4 which goes up in capacity to 1260cc. Unlike the 2002 VFR, it doesn’t use Honda’s V-TEC system, but it’s thought to produce around 120bhp – 20bhp more than the older 1084cc model. To co-operate with the latest environmental restrictions, it’s fuel-injected and features two catalytic converters – one in each of the side-exiting cans. The under-skin advances don’t stop there. The conventional fuel tank is joined by a second tank lower down which enables the bike to carry more fuel, but without you having to cope with a single, massive tank between your legs. The lower tank also helps keep the weight low, making the bike easier to ride. The Pan will be sold in two types, a basic model and a more luxurious version with features such as ABS and an electrically adjustable screen. In fact, adjustability is a key feature of the new bike. Whatever model you choose, the expansive dash allows you to raise or lower the headlight beam to account for the weight of a passenger, the seat is adjustable through three different positions, and you can also tweak rear pre-load without getting your hands dirty – there’s a hand adjuster below the seat on the left-hand side which allows you to compensate for luggage or a pillion with the twirl of a dial. With this much luggage capacity as standard, it will certainly come in useful. Just like its predecessor, the STX has colour-matched built-in panniers, each of which is lockable and removeable and can easily swallow a lid. Creature comforts don’t stop there, though – the dash is more like something you’d expect to find in a luxury car than on a bike. Not only does it feature a fuel gauge, as you’d expect, but it’s also capable of showing mpg. In fact, technophobes needn’t apply, as the console is infested with digital displays. There are two trips, an odometer, a clock and even a temperature gauge that not only displays the engine temperature, but also the outside temperature – complete with a warning for icy conditions. However, purists will find some solace in the analogue speedo and rev counter. Four-level heated grips should keep the ravages of autumn at bay. This safe and sensible approach is also echoed in the replaceable crash-guards mounted on each side, just like those on the BMW K1200LT. Other bits available from Honda include a topbox with pillion backrest and armrests – and a CD/radio. The new STX should be available next Spring and cost around £9500. n the region of £9500.